The picture above shows a a 16x16 square made from the 64 T-tetrominoes with three notches. It is known that rectangles can only be covered by T-tetrominoes, if both side length are multiples of 4. Therefore the number of elements in a set must be a multiple of 4 to construct rectangles with the whole set. For two-sided and one-sided T-tetrominoes with a given number of notches the number of different pieces and some possible constructions are listed in the following table. If you take all T-tetrominoes with up to 2 notches, you get 32 pieces and a rectangle of size 8x16 can be covered. In the picture the 17 T-tetrominoes with no notches at their long edges are marked. Since a 4x32 rectangle needs 18 of such pieces, this rectangle cannot be packed. Here is the set of T-tetrominoes with 3 notches arranged due to the number of notches at the long edge. I cut these pieces from 8mm plywood, drilled little holes for magnets and attached printed labels on front and back side. 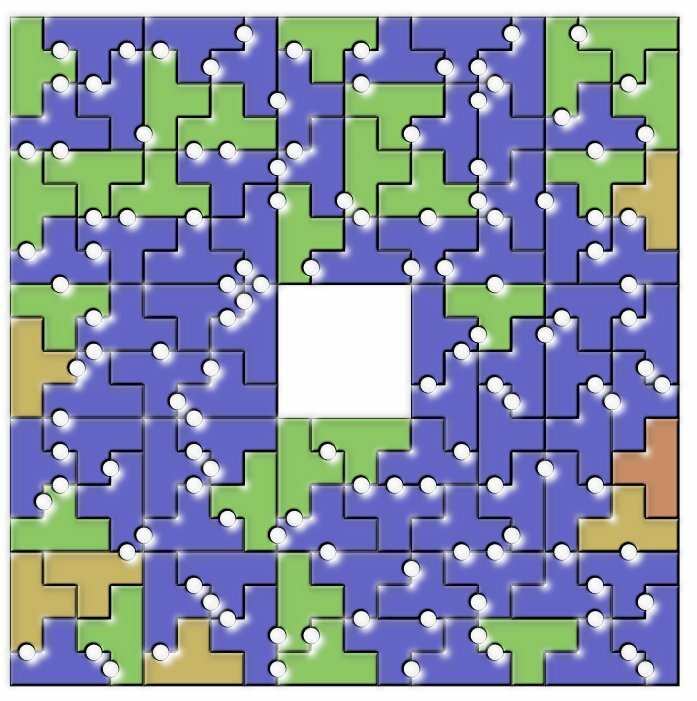 The solution for a square of size 16x16 is shown in the title, but you can't cover a 8x32 rectangle with these pieces. The rectangle has a perimeter of length 80 and therefore you need 20 T-tetrominoes with straight long edges but only 19 pieces are available. The set of T-tetrominoes with up to 3 notches contains 96 pieces. You can construct the 16x24 rectangle by using the 16x16 square made from pieces with three notches and the 8x16 rectangles made from pieces with up to 2 notches. The 8x48 and 12x32 rectangles are shown below. As usual the second rectangle was split into a 4x32 and a 8x32 rectangle with preset notches at the common border. A 20²-4² square ring can also be constructed. 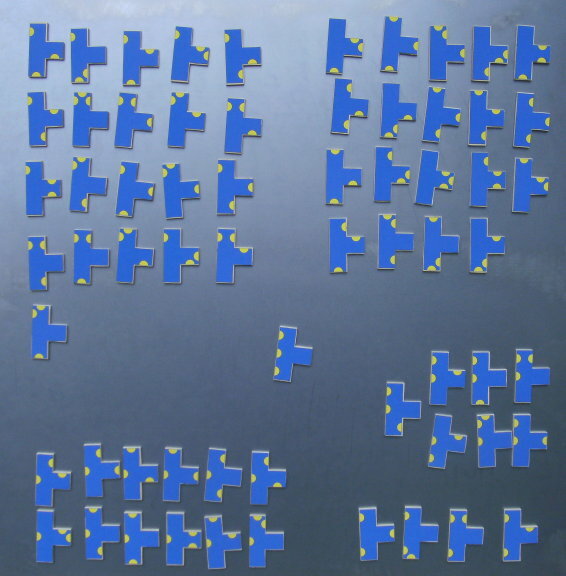 It's a combination of two L-shaped areas and the pieces are colored due to their number of notches. 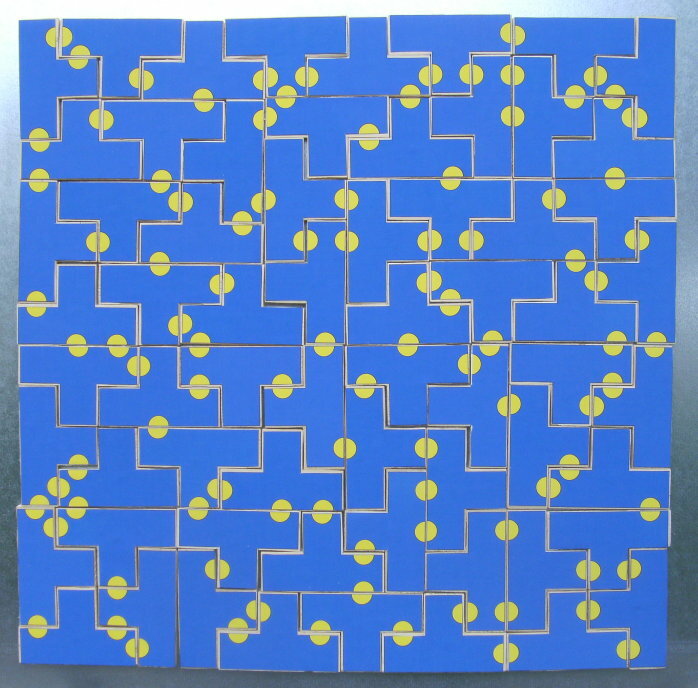 There are 56 one-sided T-tetrominoes with up to 2 notches arranged in a 28x8 rectangle. The 28 pieces with straight long edges are marked. Another rectangle, where both side length are multiples of 4, is of size 56x4 with a perimeter of 120. Therefore you would need 30 pieces with no notches at their long side, but there are only 28 in the set. 120 one-sided T-tetrominoes with 3 notches can be packed in a 24x20 or 12x40 rectangle. Since only 35 pieces have notch free long sides, it seems to be difficult if possible at all to get a 8x60 rectangle, where 34 of these pieces are needed. If the sets of one-sided pieces with up to 2 notches and those with 3 notches are joined, we get 176 pieces and rectangles of size 8x88 and 16x44 can be covered. A paper about tiling of rectangles with T-tetrominoes helped to restrict the search so that even with a slow computer a solution was found.